DNA barcoding was used to investigate dietary habits and prey selection in members of the African-endemic family Distichodontidae noteworthy for displaying highly specialized ectoparasitic fin-eating behaviors (pterygophagy). Fin fragments recovered from the stomachs of representatives of three putatively pterygophagous distichodontid genera (Phago, Eugnathichthys, and Ichthyborus) were sequenced for the mitochondrial gene co1. DNA barcodes (co1 sequences) were then used to identify prey items in order to determine whether pterygophagous distichodontids are opportunistic generalists or strict specialists with regard to prey selection and, whether as previously proposed, aggressive mimicry is used as a strategy for successful pterygophagy. Our findings do not support the hypothesis of aggressive mimicry suggesting instead that, despite the possession of highly specialized trophic anatomies, fin-eating distichodontids are opportunistic generalists, preying on fishes from a wide phylogenetic spectrum and to the extent of engaging in cannibalism. 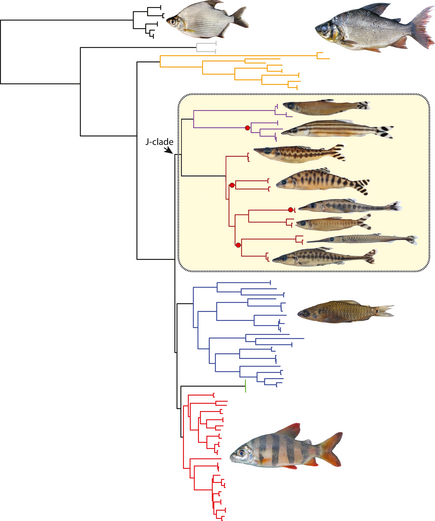 This study demonstrates how DNA barcoding can be used to shed light on evolutionary and ecological aspects of highly specialized ectoparasitic fin-eating behaviors by enabling the identification of prey species from small pieces of fins found in fish stomachs. Figure 2. Characteristically damaged fins in Phago specimens victims of pterygophagy. Scale bars represent 1 cm. Figure 1. 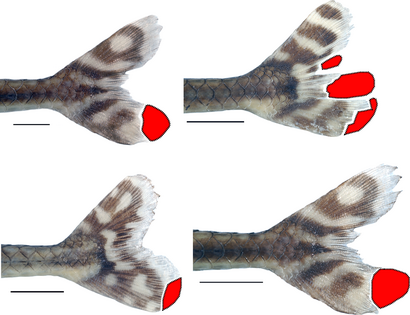 Variation in jaw anatomy in pterygophagous distichodontids represented in this study by the genera Phago (A), Eugnathichthys (B), and Ichthyborus (C).